It was an EPIC retreat! EPIC is the Emerging Professionals in Camping organization, a branch of the American Camp Association (ACA). 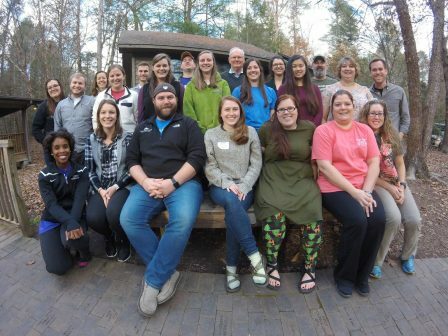 The purpose of EPIC is to provide networking opportunities and to help educate and support those in the camping profession and those who aspire to be in the profession. I was fortunate enough to attend this year’s Southeast EPIC Winter Retreat. It’s considered an “anti-conference” because of its small, intimate setting and group size compared to the large scale setting found at conferences. It was a wonderful two day retreat full with educational sessions with Bob Ditter, networking and collaboration time, a tour of Camp WaBak (where we were staying), and of course late night board games! Majority of the sessions focused on leadership styles at camp. There are many things I am excited to bring back to the team at Camp Merri-Mac. A few of those things include: surveys to identify character strengths, various evaluation techniques, and different leadership styles. This retreat is a wonderful way for camp staff to re-energize and get a taste of the summer to come. More than a weekend away, it is a great time for staff and leadership development. One of our important values here at Camp Merri-Mac is to develop staff, taking this time in the off-season to develop our core leadership team has lasting effects on each summer, on how we train our counselors, and on the experience campers have. Our fantastic group of camp professionals! Camps from Western North Carolina, Eastern Carolina, and South Carolina joined in. Bob Ditter is a senior level clinical social worker who specializes in the evaluation and treatment of children, adolescents and their families. He maintains a clinical psychotherapy practice in Boston, Massachusetts, and consults nationally with agencies that work with young people. He has been working in the camping industry since 1982 and has worked with over 400 summer camps. Bob brings his clinical training together with his knowledge of young people and organizational development for a powerful combination of programs, including staff interviewing, training and development, mentoring programs, child abuse prevention, team development, group process and crisis intervention.